★ EASY INSTALL – Just Simply Clip The Car Mount Into Your Vent & Put Your Phone In The Mount. It’s That Simple, Never Deal With The Hassle Of A Bulky Car Mount Again! The Auto Tech Phone Mount Is Elegantly Designed & Has A Tough, Ultra Durable Grip So Your Phone Will Stay Safe & Secure At All Times. Even If You Hit Potholes Or Rough Bumps In The Road, Your Phone Will Not Shake, Move Or Shift In The Holder. ★ 360° ROTATION – Capable Of Full 360° Degree Rotation. By Rotating The Car Mount It Clicks Into Place Offering The Perfect Viewing Angle For Your Device. 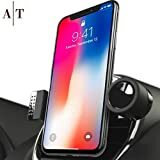 ★ FITS ALL CAR VENTS – The Auto Tech Phone Mount Fits On All Car Vents So You Can Take Your Mount Anywhere You Go. Get Easy Access To Your Charging Port Or Audio Input At All Times. It Can Easily Be Mounted Horizontally, Vertically, Or At An Angle Based On Your Preference. Also It’s Fully Equipped With Two Powerful Grip Settings To Fit On Small Or Larger Vents. The Grips Were Carefully Designed To Prevent Stains, Scratches, Scuffs Or Marks On Your Vents And Dashboard. ★ FITS ALL PHONES – The Auto Tech Phone Mount Is Compatible With All iPhone & Android Devices. Including But Not Limited To – Blackberry, iPhone 5/5S/5C, iPhone 6/6S, iPhone 6 Plus/6S Plus, iPhone 7/7 Plus, iPhone 8/8 Plus, iPhone X, Samsung Galaxy S4, S5, S6, S6 Edge, Note 3, Note 4, Note 5, Google Pixel, Pixel XL, LG G4, LG V10, Nexus 6P. ★ LIFETIME WARRANTY – If For Whatever Reason You Don’t Absolutely Love Your Car Mount, Just Return It And We Will Refund Every Penny Or Replace It, No Questions Asked! Now That’s A Guarantee!